I’ve been to Ethiopia three times now, but this past trip was the first time I left Addis Ababa. The countryside was incredible: mountainous, green, and rugged. There were few cars along the newly paved road, but a great deal of foot traffic. 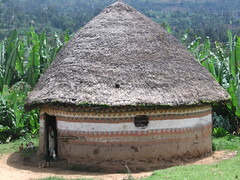 The highlight was a visit to family who lived in a traditional Ethiopian hut, ubiquitous outside of Addis. The huts usually are surrounded by corn and false banana, an essential crop for food and materials. The hut was suprisingly spacious, with an area for sleeping, food storage, a central fire pit, and a fenced area for the family’s two cows, who, as is common throughout the country, sleep inside with the family. What are the actual names for these Huts?